Sakari Oramo conducts the BBC Symphony Orchestra. Haydn: Symphony No 34 in D minor. Charlotte Bray: Falling in the Fire (with Guy Johnston: cello). Mahler: Symphony No 5. 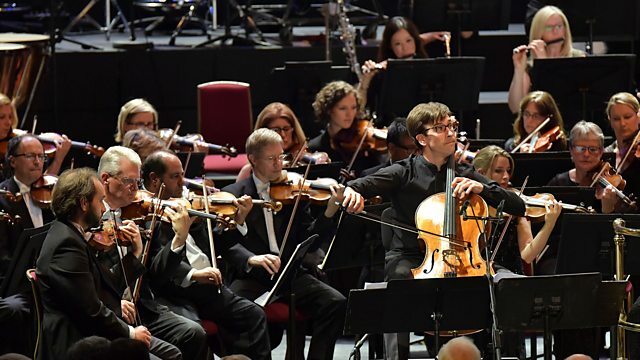 The BBC Symphony Orchestra and Sakari Oramo at the BBC Proms in Mahler's 5th Symphony, Haydn's Symphony No 34 and Charlotte Bray's Falling in the Fire, with cellist Guy Johnston. The latest in the series of Proms cello concertos is a powerful new work from Charlotte Bray, an expression of 'moral outrage' at the destruction of the ancient city of Palmyra, Syria, last summer, after which 'everything changed' in the composer's compositional outlook. Similarly, something changed in Mahler when he came to write his Fifth Symphony. Not only had he survived a haemorrhage that had nearly killed him, but he had also met and fallen in love with Alma Schindler, for whom the Fifth Symphony's ardent Adagietto is a love song. Before that, Haydn's Symphony No 34 makes its first appearance at the Proms. Performer: Guy Johnston. Orchestra: BBC Symphony Orchestra. Conductor: Sakari Oramo.